Discussion in 'Map Factory' started by Khuntza, Aug 27, 2010. 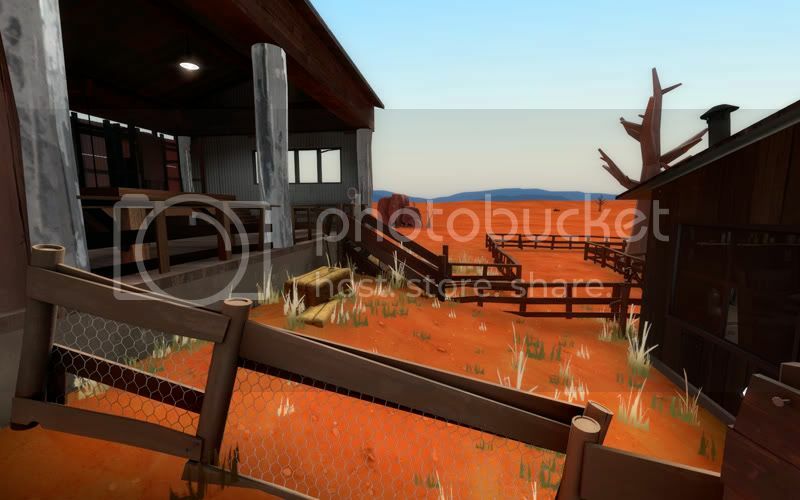 So I've decided to take a crack at the artpass contest..
After thinking about it for a while I decided to go with an Australian outback theme. 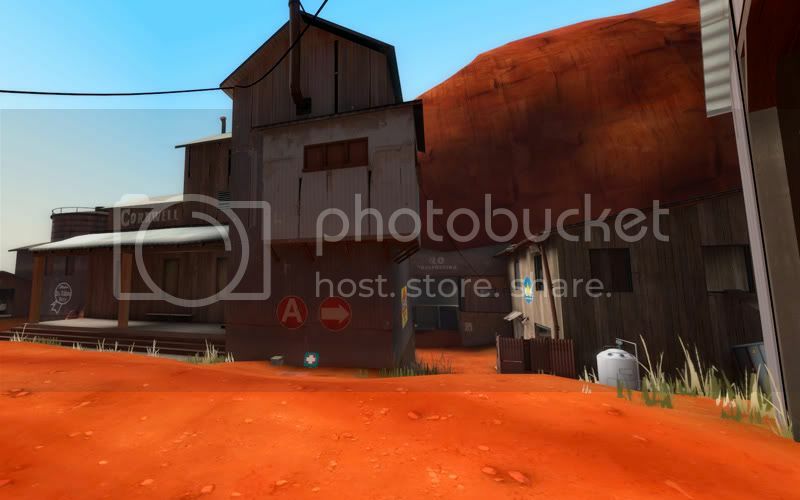 I've decided this for a few reasons, a lot of the current content easily fits this theme, the TF2 mythology uses alot of Australian references such as Australium and thirdly I just might be able to make Robin Walker homesick! 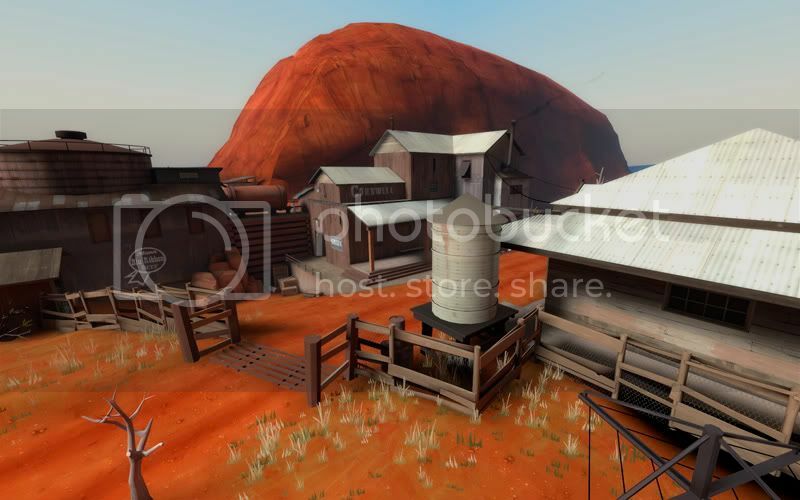 The concept is that it is a farming homestead with a shearing shed and the like with a red base buried within Ayres Rock (Uluru) housing an Australium mine featuring as the final point. Right now its probably about 70% finished. Lighting is still pretty basic and needs work, optimisation is about 50% complete, sound is yet to be added. Right now I'm focused on props, overlays and func_detail brushes, all the pretty stuff. 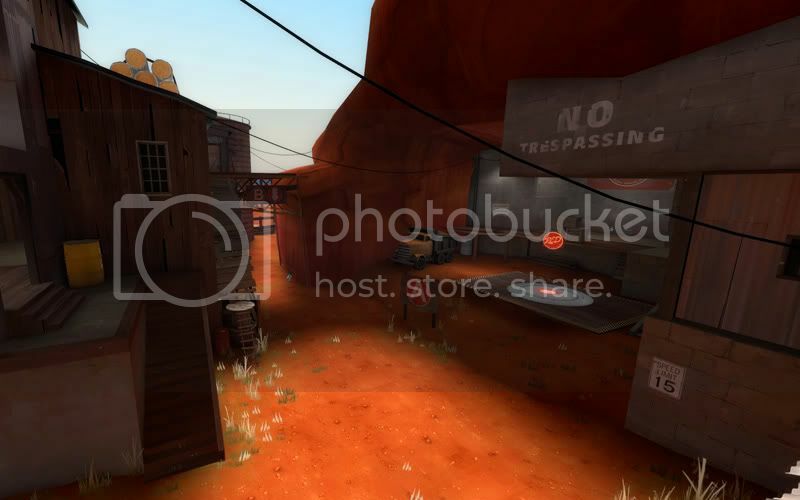 A note on the screenies, I run TF2 on an eyefinity setup so they are taken with a really wide resolution, Ive cropped them down, but they are still wider than normal, hence the funny FOV. Also for whatever reason my screenies always seem to have contrast issues when I run them through photoshop so they appear a darker than they are in game and I CBF spending too much time getting them right at this stage.. later I will though. Looking forward to getting some feedback! Please remember though that its still very much a WIP, I've already got a pretty good idea of what the current issues are and what needs work. Before anyone says it, Yes! I'm aware its very 'red', but that's kind of what I'm going for, however the textures aren't final just yet and will likely be tweaked. That's actually a really cool and clever concept, can't wait to see where you're going with this. 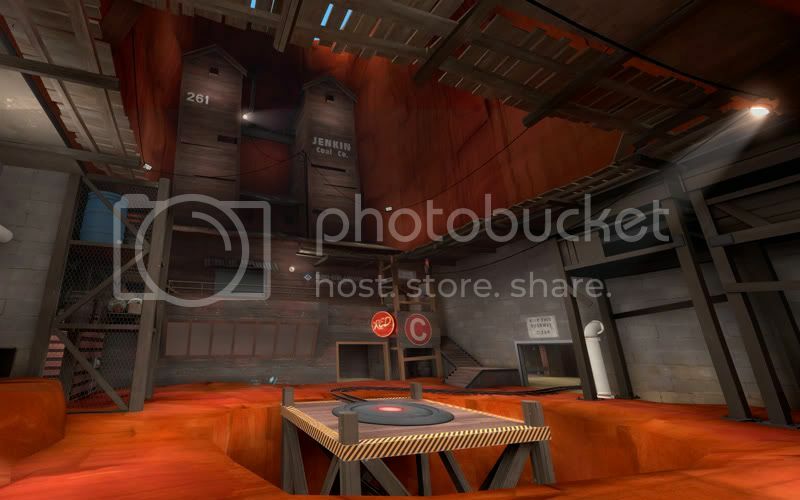 I like some of the things you've done, such as the wooden platform above C.
And the "Ubermite" spray/poster gave me a chuckle. I hope you release the assets at some point. 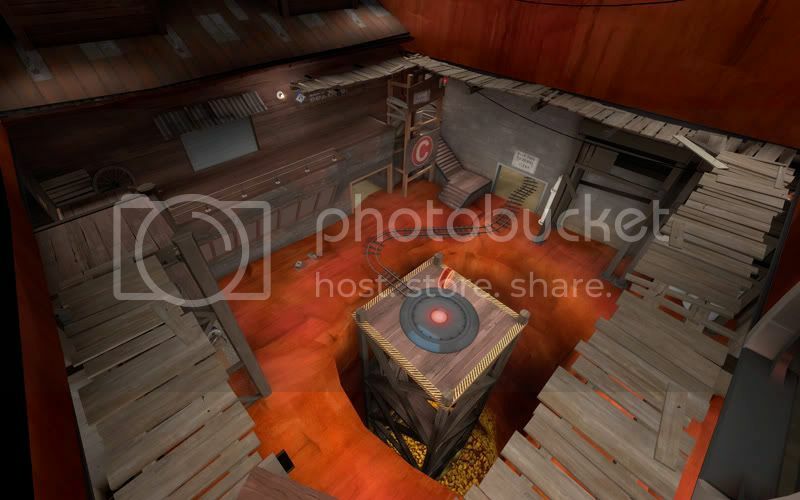 Also mad props, because the first thing I though of when i saw the first screenshot was Autstalia, and then I read the description. You nailed the theme. I personally think it looks too red/orange. Perhaps it is the odd contrast of the green grass that makes it look so strange, or perhaps it's the texture itself. The ground is, maybe. But then I went and looked up some images. Your ground, sir, is not nearly orange enough. Your grass sprites look like they've been run through the Shaded Textured viewport. Yeah, how red to make the ground texture is something that I'm not sure I've locked down just yet. 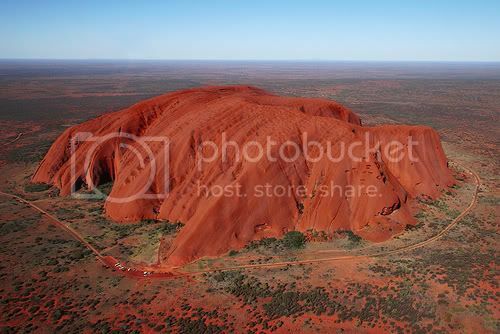 To accurately represent the Australian Outback, particularly around Uluru, the texture should be almost unnaturally red. But! make it too red and it will contrast against the red of the red players. That, and it might cause retina damage, lol. Don't make it red enough and I might as well use one of the existing ground textures from the game. Bottom line is that the ground has to be red, but how far do I take it? 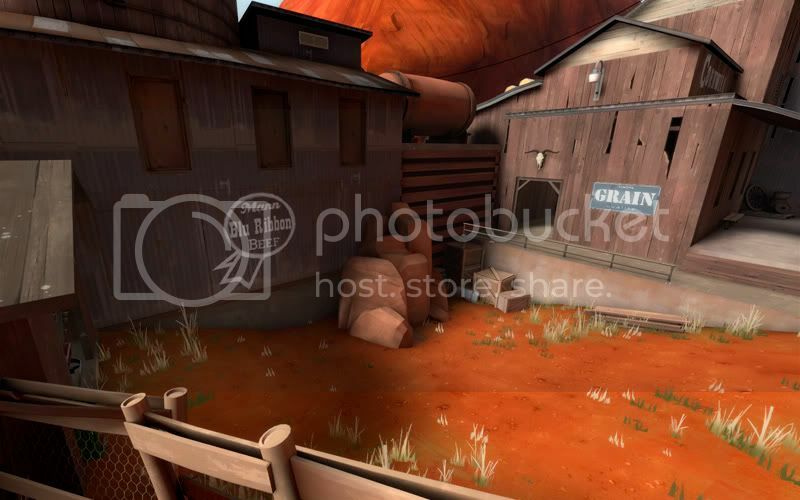 Here is a couple of photos I grabbed for reference purposes during initial concepting. You can see in this pic just how red the environment really is. 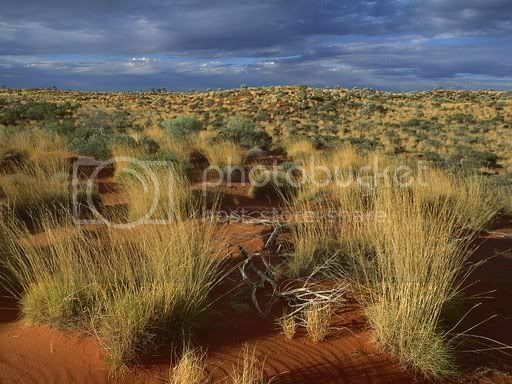 This is the reference I used for the grass sprites.. you can see how much the foliage contrasts against the red earth..
Grass should be green at the bottom and gradient to light brown. But then i'm sure the existing dessert foliage would suitably fit your theme anyway. Or atleast get a custom prop for the tall patchy strands. 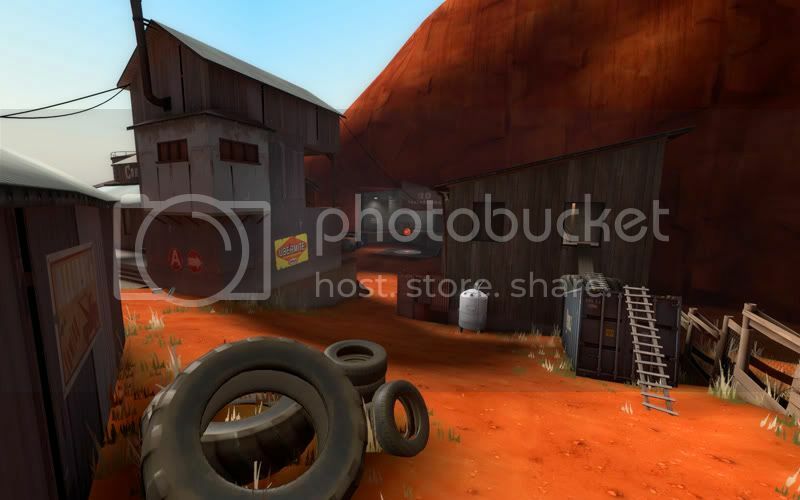 I like the orange sand, sets the theme well. I feel like the rock in the 3dskybox should be further away and larger though. 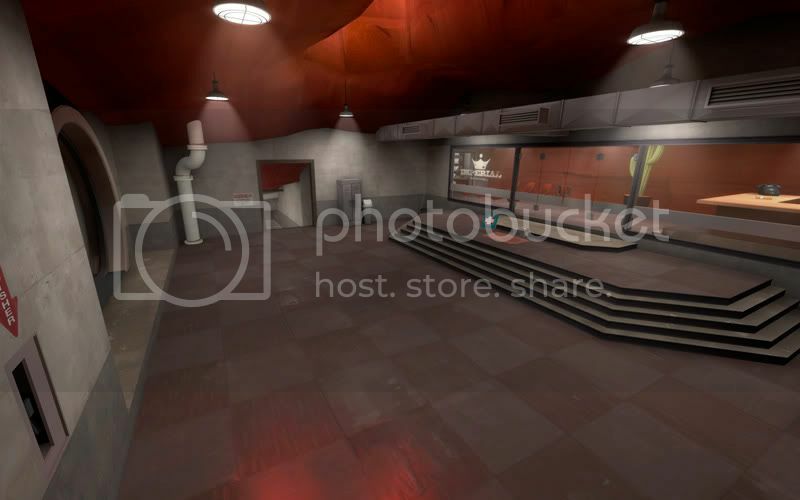 Has anyone got any experience with Left 4 Dead 2 modding? I need the cricket bat ( or paddle bat if you will, lol) model from left for dead 2 to be used as a static prop.. Ive had a google myself and know it'll be in one of the vpk files, but which? and even if I manage to extract it will it then need to be recompiled to be able to be used in TF2? 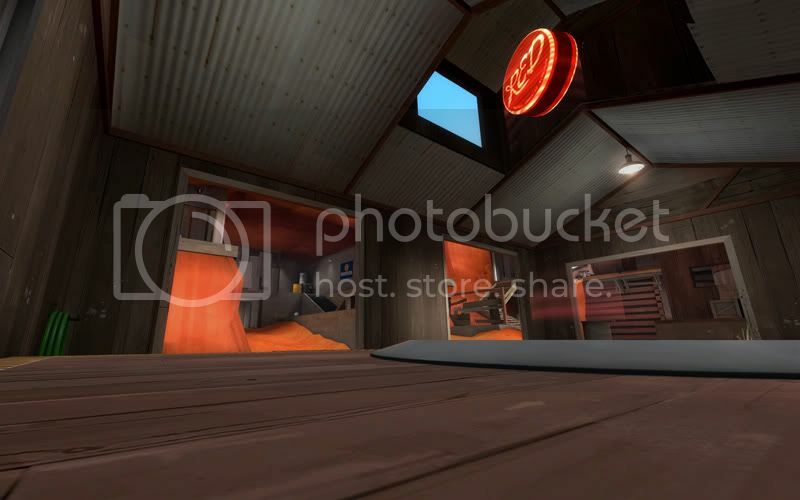 Inside will be a models folder and a texture folder (may be in different gfc files, I've only done this for TF2). You'll be looking for a cricket_bat.mdl, in all likelyhood. Possibly "paddle_bat.mdl." Then you'll have to find its matching texture. 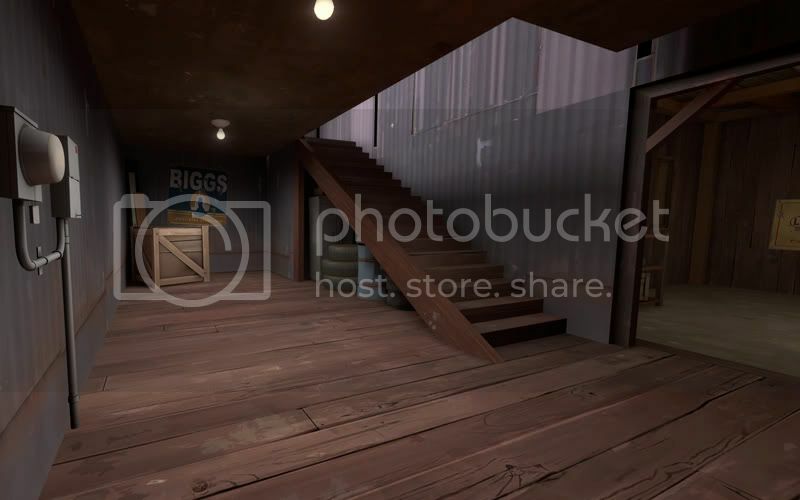 Remember that TF2 has a different art style than Left 4 Dead 2, so you'll probably need to edit the texture a bit. Thanks for trying to help Draco18s.. I'm all too familiar with the TF2/cgf structure of things but L4D is different.. it uses a series of .VPK files.. apparently gcfscape can open them but I was more wondering if converting a weapon model to a static prop would require any trickery or recompiling of the model.. I'm fine doing re-skinning and such, but I don't have much experience with creating custom models..
Been slaving away.. Here's a bunch of fresh screenies.. I see the upload thread is live.. Ill probably release a RC later tonight..
99% finished.. just a few tweaks I want to make. The closing days will likely be spent adding some more custom signage. 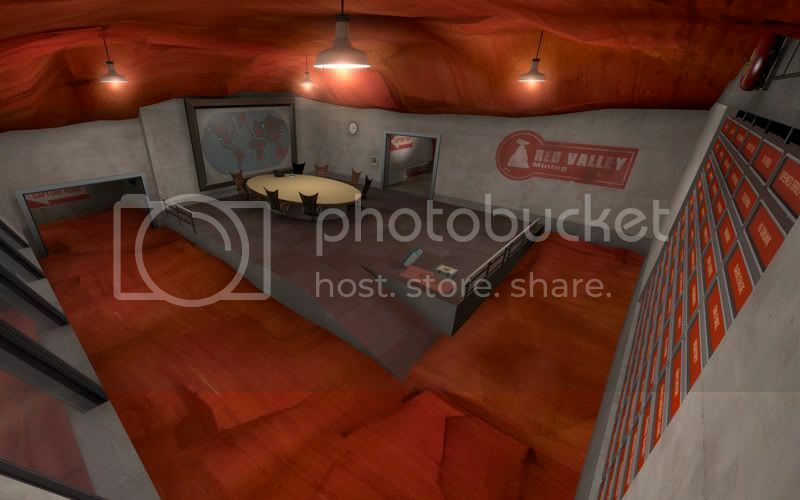 I know you're excited about the new colour, but while it works at the last point, in your second-to-last picture it seems a bit weird to have in an otherwise spy-techy room. I like the atmosphere a lot though, it's like they're really invading Ayers Rock. I know you're excited about the new colour, but while it works at the last point, in your second-to-last picture it seems a bit weird to have in an otherwise spy-techy room. Indeed, It'd look nice having a concrete floor, and maybe a dusty transition on the left door? Keep the top of the room as rock though, it looks great.